Home » lost , television » LOST celebrates 100 episodes tonight with "The Variable"
LOST celebrates 100 episodes tonight with "The Variable"
Didn't get to comment on Lost during the past month ('cuz I was busy with... other projects) but if you're a faithful viewer, you already know that the past few episodes have been everything from intense, to heartbreaking, to hilarious. I'm still giggling at Hurley's attempt to "improve" The Empire Strikes Back and get it to George Lucas in time to keep the Ewoks from ever happening. And tonight's episode, "The Variable", portends to be a doozy. It's the one hundredth episode of Lost, so maybe it's time to start answering some long-standing questions? 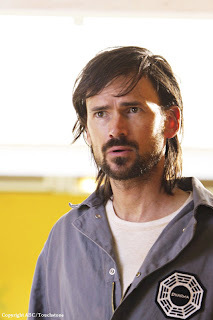 At the end of last week's installment Daniel Faraday (Jeremy Davies, right) returned after an absence of a few episodes and possibly three years - bear in mind that most of the characters are now stuck in 1977 - and word is that tonight he finally "comes clean" about what he knows about the Island. There's also rumor that "The Variable" will be something of a companion piece/flip-side story to last season's amazing "The Constant", thought by many to be one of the best of the entire series to date. In case you need a "brush-up" of everything that's happened that's brought this story to its one hundredth episode, TVOvermind has a great compilation of what it considers to be the 100 best Lost moments of the past five season.